This 5-day workshop will explore creating individualized, “wearable studios” for digital naturalism. 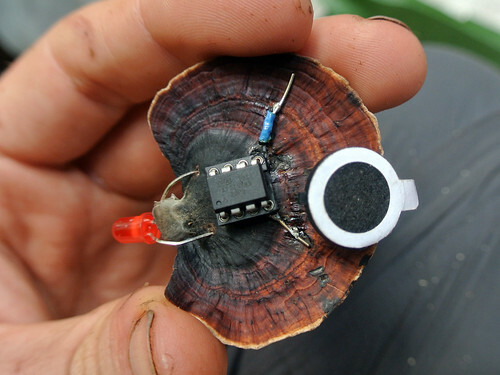 The goal is to create, test, and document mobile laboratory gear for creating interactive electronics in natural areas. Like anyone’s personal creative space, these “wearable studios” (http://www.plusea.at/?category_name=a-wearable-studio-practice) can be highly individualized for your own technological or artistic practice. When building in nature, however, the studios should also adapt and utilize characteristics of the local environment. 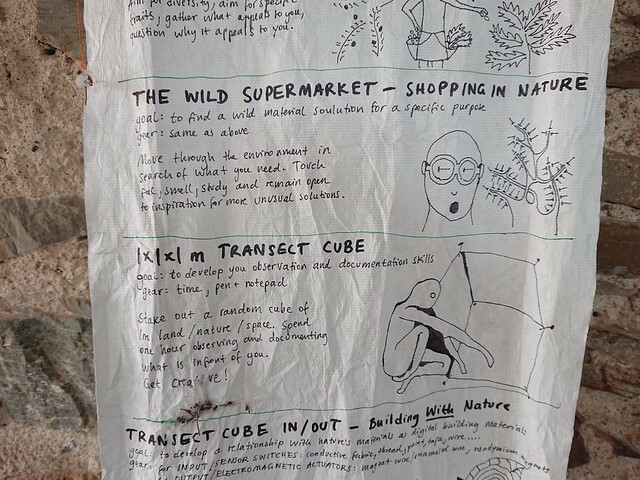 In this workshop, participants will go through series of exercises exploring environmental and technological features to build their own wilderness laboratories. We will document and share the unique studios and tools created through this process to provide resources and inspiration for other digital naturalists investigating similar challenges. Andy and Hannah making stuff in their JungleLab in Madagascar. The students taking this course have spent the last weeks/months exploring and developing extra senses. packing tools in your pockets or Strapping them to your body, means you have them at hand outside their regular realm of use. consider the presence of these capabilities provided to you by your tools and extra senses, extra powers with which you can investigate and manipulate your environment. the jungle becomes a different place when you have the power to cut down the plants that obscure your path. or with a needle and thread, every sewable material can be turned into something you want. 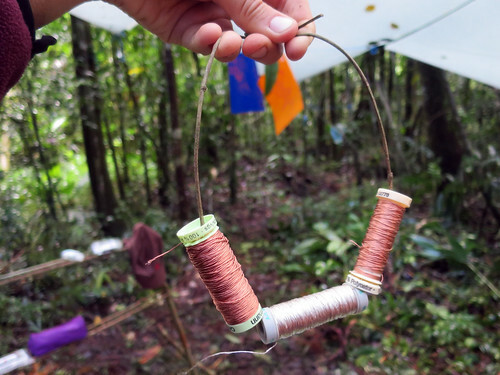 We will pack up our daypacks with materials and tools that students think they will need to re-make a physical computing projects which they have previously built inside the studio/lab/workshop, outdoors in the wild. In doing so they will experiance the challenges and inspirations that come from being out in nature without the comforts and infrastructure we are used to. No power, no lasercutters, no flat work surfaces, no chairs, no lighting, no component draws, nobody’s scissors to borrow nor pens and paper in abundance – BUT! trees full of leaves that can be used as speaker membranes, mushroom circuitboards, bark writing surfaces, trees to tie tables to… we will become resourceful and creative. Andy and Hannah will introduce the workshop contents either on the bus-ride on once at Valldaura. 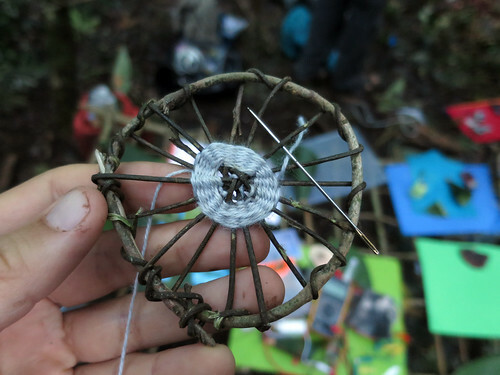 We will explain the motivation for the workshop and mentions some of the previous work we’ve both done, but mostly we want to get straight out into the wild for the students to experience building in the wild themsevles. Assemble pegboard pincushion bracelets in order to introduce pegboard sewing technique and first experiance of having a tool with you at all times – a pin. 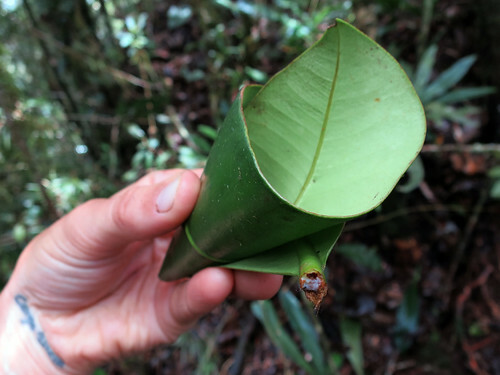 Along the way, as we are walking through the wild, collect materials that you could use to make a circuitboard with. Harvesting pouches, bags. 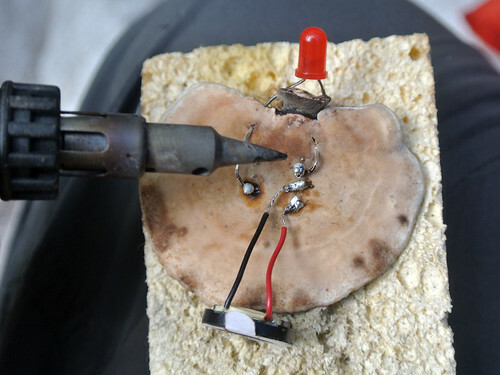 Made from collected materials: Leaf speaker, vine and conductive yarn pressure sensor. Stake out a random 1sqm area of land and spend 1 hour with it. Documentation: be creative in how you document what you see. 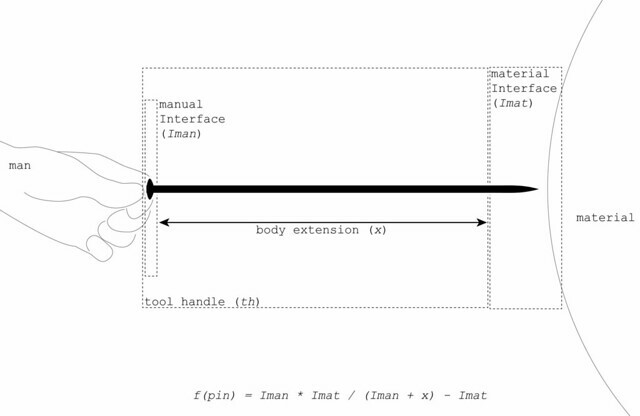 merge with you tool. tools are senses. select one of the tools that you use often and think of how and where you could strap/attach this to your body. try working with it this way. can you master this new situation? – every time you see something red you pause for 10 seconds and observe all that you can see. – everytime you hear a certain sound you copy it. throughout all these exercises take a moment to observe each other. take photographs, sketches, notes of what you see. the ways your bodies work in nature when making in nature. find an insect and try to observe it for 10 minutes. feel free to touch it, displace it, build contraptions to test it’s reactions. document all that you see! Ask yourself: what senses do animal have? Participants need to bring all components needed to re-create an interactive project they already built earlier with you all (perhaps the sensory devices). 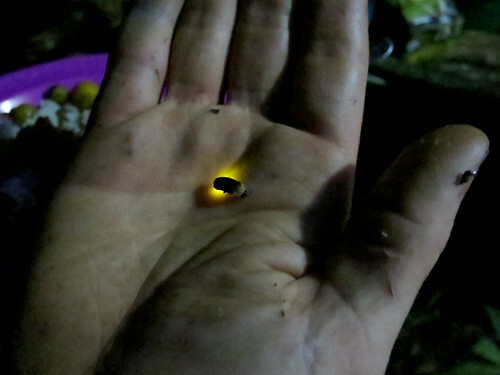 Night time collecting: glow-worm on palm of hand. 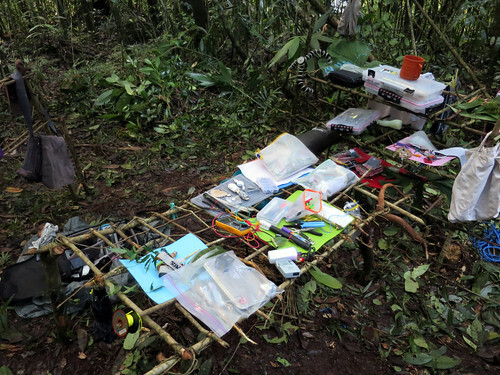 JungleLab: the table for working at. 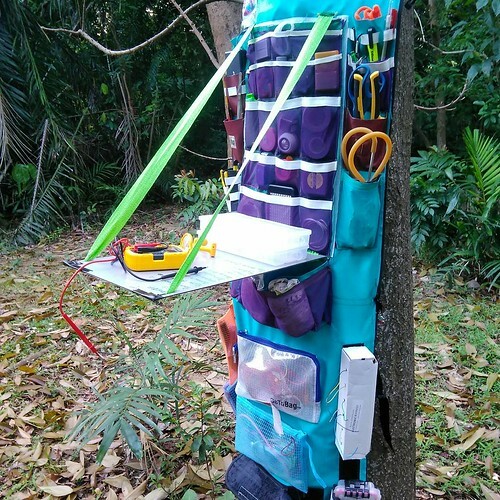 Andy’s PIFpack strapped to a tree. Storage elements: Thread rack made from vine. 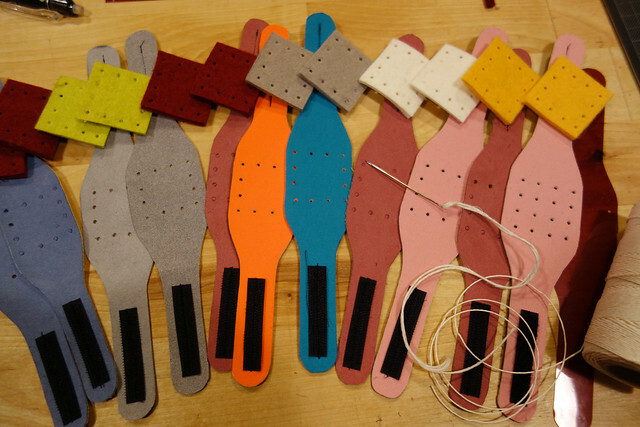 Participants go on short excursions to test their wearable studios, examine what works, and what can be changed. They then iterate on these designs. We will assign participants short tasks to complete with the studios they developed (perhaps with regard to some of the interactive technology they have already been working on). 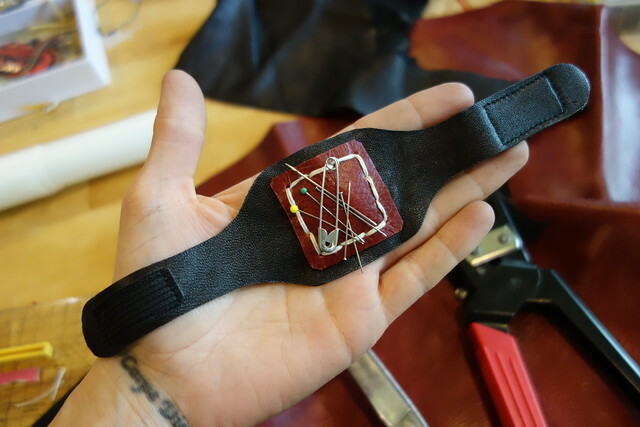 Participants venture out with their wearable studio for a longer trip. (Documentation) During this time participants are tasked with creating final documentation of their projects. 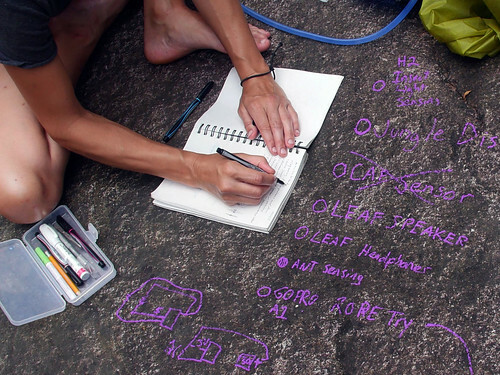 Be creative in thinking of unique ways to capture, document and share your design. Final presentations of the projects.